The campsite Sunêlia Aluna vacation is an outdoor hotel 5 stars. It offers the services and facilities of all kinds. They include pitches and playgrounds and sports, a water park for lovers of water sports and holiday feet in the water or one space relaxation and well-being. The latter is a corner dedicated particularly to large people. Its design is intended to give them a moment's rest to release the stress and to delve into a world of total relaxation. What to do in the relaxation area? You maybe wondering what there is to do in the relaxation of the camping area? You have a choice between several benefits when you get there. For a relationship of the body and the spirit, a professional team welcomes you to the spa Aluna. In addition, you will have the choice between the open space with a jacuzzi or interior space with the Hammam. Entrust your well-being in the capable hands of the staff who work there. There are rituals of the spa and well-being, scrubs and body massages sessions. Professional products are updated with your proposal. In addition, the wellness area also has professionals in aesthetics. Face care, the care of duo and many other formulas are available by qualified beauticians. There are also some make-up artists and experts in nail salon that will be made available. So, you can do the manicure, pedicure or makeup. All these activities are feasible solo, couples, with friends or family members. To benefit from these services, make a reservation in advance. Who opens this space well-being and relaxation? Space well-being and relaxation gives advantage to the inhabitants of the campsite. 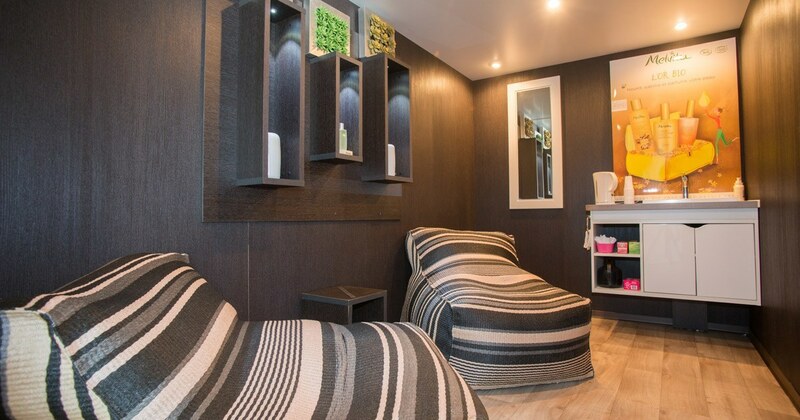 So if you rent a location for motorhome, caravan or tent or lodge a rental or a tent, you can the right to make a reservation at the Spa. If you need to know the rates of benefits that are offered, you can inquire at the reception of the campsite. It is also possible to get there directly and ask the necessary information to professionals who work there. Why go to space relaxation and well-being? Relaxation and wellness space is a place for those who need a maximum of relaxation. It's a perfect spot to find yourself face to face with your lover or your lover unless we come to embarrass you. After a hectic day in the campsite or an exit in the vicinity, you can get there for de-stress you and evacuate fatigue. After massage made by masseuses who work there or the Jacuzzi, you can light enter your shelter, prepare your evening meal and sleep peacefully. The next day, you can attack a new day with lots of energy and with a very good mine.